Bathroom Renovation Designs are as varied as people are. Some people like a basic bathroom renovation, while others like all the bells and whistles they can get, turning their bathroom into a retreat from the pressures of the world. Many people would like a bathroom with more features or personality but haven’t been able to create what they want, because they do not have any idea of how to get bathroom design ideas that meet their needs. We are going to give you some basics of bathroom renovation ideas for Auckland Homes, to start you on your way toward not just redesigning your new bathroom but perhaps leading to a complete bathroom renovation/ remodelling. The first thing you need to think about in renovating your bathroom is how you use your present bathroom, what you like about it and what its deficiencies are. From this information you can begin to think about your ideal renovated bathroom. For instance, do you like taking baths, maybe in a whirlpool tub? Do you have enough storage space? How is the lighting in the bathroom? What about location - are your bathrooms in the right place? Do you have enough bathrooms or do you want to add one? Start with some basic questions and begin to get some basic answers, and begin writing down what you want. From magazines and the internet compile a file or “scrapbook” of your ideal bathroom - layout, ideas for floor and wall treatments, and the type of fixtures you’d like to have. Do you need to add a new bathroom? If so, where will you put it? Let’s focus on some beginning steps of bathroom designs and how to create a bathroom renovation as close to your ideal. The first thing you should do is make a scale sketch of how your bathroom is now. This will give you a good idea of how much space you have to work with as you redesign your bathroom. After you have done this you will need to determine what arrangement of items you will want in your new bathroom, then draw templates of those items to scale and see where they fit into the space you have. As you get started with your bathroom design, you will want to think about locating your fixtures in the proper order. In a full bath design, the sink is used most often, the toilet is used next most often, and the bath and/or shower are used the least. With this in mind, most bathrooms are designed with the sink nearest the door, the toilet next and then the bath or shower. So keep in mind location and accessibility in a renovated bathroom design. At this point it is a good idea to think about whether you want to expand the size of your bathroom. To do this, you will either need to expand into other space adjacent or adjoining the bathroom, or even build the bathroom out, perhaps adding a bump-out to your house. Adding space by enlarging outside is going to be more costly, require more work and contractors, and is probably only doable on the ground floor. For now we’ll focus on expanding within the space you already have. So where can you get space to expand if you want to? Is there an adjoining closet or room that you would not mind being a little smaller, so you can take space from it to add to your new renovated bathroom? If you are below an attic or you have space in a kneewall ( a partition that forms a side wall or supports roof rafters under a pitched roof), is that space usable? Be aware that using attic or kneewall space will take some structural work. You may even think about taking a whole adjacent room to enlarge the bathroom. You might take half an adjoining room for the bathroom if it is available; then convert the remainder of that room into a home office or other space. For homeowners who do not have children, or whose children have grown up and left home leaving an empty room, perhaps you can use the bedroom space they have vacated for expanding the bathroom. One reason for the trend in bathroom expansion is to add a shower separate from the tub, and perhaps replace the regular bathtub previously used for both showers and baths with a large soaking, whirlpool type tub. 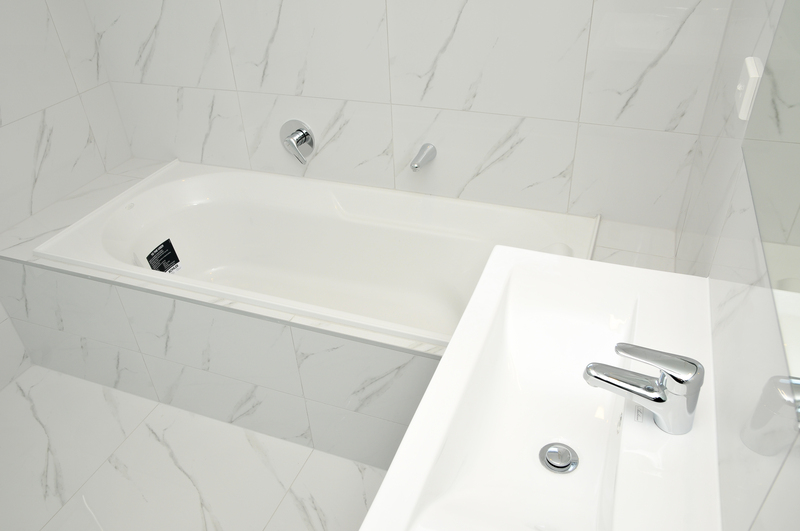 Often the soaking tub can be placed under an eave or into a part of the kneewall, minimizing its larger space requirement, since with a stand-alone shower the need for space to stand up in the tub is not as necessary. Make sure however, that the bathtub has enough headroom to meet building codes. Another reason for a bathroom renovation expansion is the installation of other items in addition to stand alone showers. Many bathrooms lack storage, and an expansion can help with storage of towels, cosmetics and other bathroom necessities. Often today people are expanding bathrooms so that they may install an additional sink to have his and her sinks so that when getting ready to go out, there is not a struggle to use a single sink. There are many new and unusual designs for sinks today, many of them not as expensive as they may look. Homeowners are now also adding dressing rooms off their bathrooms into adjoining space . A dressing room or walk-in closet off the bathroom allows them to take a shower or bath and have their clothing right at hand. Sometimes with a major remodel the walk-in closet can be entered from the bathroom and from an adjoining master bedroom. Bathroom renovation designs are also being done to find alternate space for toilets, away from the sink, tubs and showers. Toilets are now often being placed in a separate space within the bathroom, a sub- room if you will, sometimes humorously called a throne room. This type of toilet setup can provide more privacy and allow more than one person to use the bathroom simultaneously. Although most often thought of as a bathroom fixture only in Europe, bidets are now beginning to be seen in more homes elsewhere in the world, adding an extra fixture adjacent to the toilet. Bidets provide enhanced hygiene for users, and although still considered a luxury, they are showing up throughout the world. If thinking about adding a bidet, however, be aware that there may be special plumbing required (unlike toilets, bidets require both cold and hot water). Many people are looking at large and small bathroom renovations as a way to enhance their lives, not only providing for hygiene, but creating a room that provides enhanced relaxation from today’s busy world. And extra space just makes a bathroom more usable. There are so many bathroom design ideas and themes available today, from modern to traditional to Asian design, people are looking at bathrooms as additional living space instead of merely functional living space.